Challenging assumptions behind 1+1=2 makes for a great case study. For instance, we know that looking at the same thing from other viewpoints can change that thing. This happens when one looks at 1+1=2 in different ways. Answers change. What make it a great case study are its simplicity and apparent unalterable truth. One can change the views very simply to get simply understood answers. In short, 1+1=2 really shows how fickle facts can be. It matters who is looking at them and from what point of view. 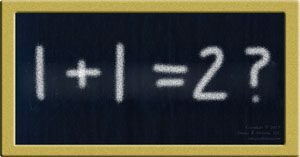 Challenging assumptions behind 1+1=2 trains our brain to spot hidden assumptions and makes us better problem solvers. The reason why 1+1=2 is that that’s the rule of a numeric language called Base 10. Our daily lives work under the assumption that any number we see uses this language. We assume it so much that we no longer know we are assuming. In this language, 1+1=2 shows up as 1+1=10. All we did was change the language of numbers. It’s similar to how the word “run” changes depending on how we use it. We’re just changing context, a common way of changing how things work. An easy way of challenging assumptions behind 1+1=2 is to say they aren’t numbers. They’re shapes. So the third expression says that we’re adding one shape to another. That give us two. By changing to a different shape we can see this more easily. Imagine adding one club to another. That gives us ♣ + ♣ = ♣♣. From this view then, 1+1=11 says the same thing. Another way to challenge looking at 1+1 as numbers is to look at them symbolically. For instance, consider that one man plus one woman equals one couple. In short, we are challenging what each number represents. Thus, we can get 1+1=1. As other examples, consider that to get a single drink one might have to combine one part A and one part B. Here’s one more. One day equals one period of daylight and one of darkness. Thus, by challenging assumptions behind1+1=2, this case study trains our minds in two ways. First, it trains it to spot assumptions. Then, it trains it to change them so we look at things from a different viewpoint. This not only helps us spot problems and solutions. It also helps to open many other doors that we would not otherwise see locked in by one view. Glad they made sense to you in the spirit of your original post. I’m subscribed to your blog and follow you on Twitter. Very good alignment of my thinking with your writing. Recommend your blog quite frequently as well.